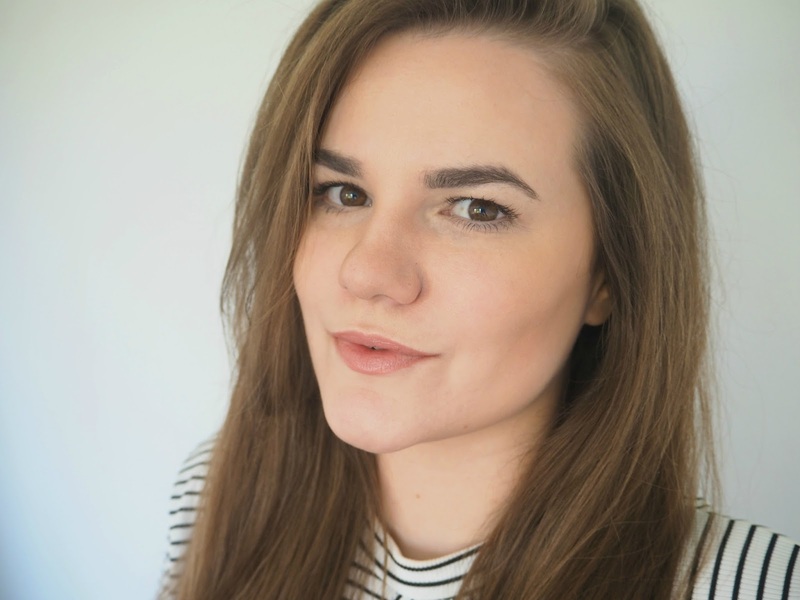 Experimenting with new foundations and base products is one of my passions when it comes to makeup, I live by the rule that if your base is perfect, then the rest will fall into place. 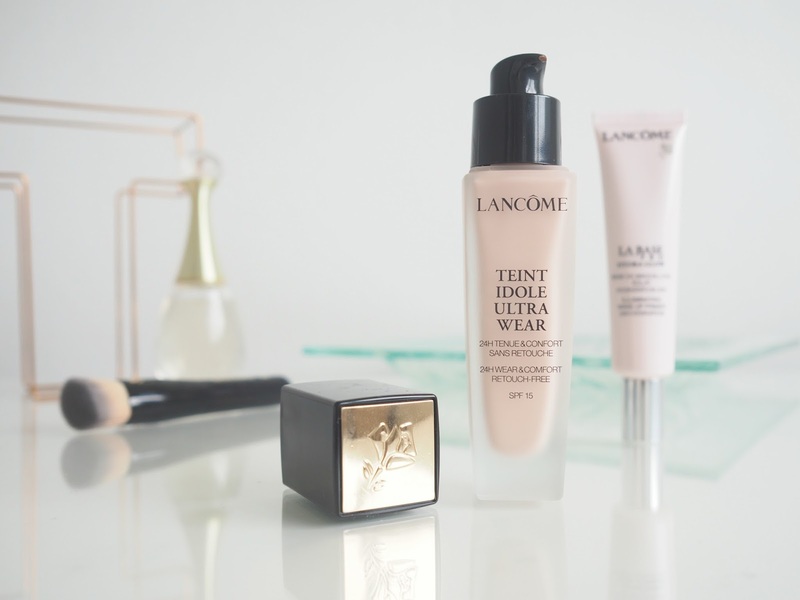 You may remember reading my blog post about discovering some new products from Lancome last year (if not, you can read it here) which included their Teint Idole Ultra Cushion Foundation that I loved, so when I heard that they were relaunching their Teint Idole Ultra Wear, I couldn't wait to give them a try. The re-release comes as Teint Idole Foundation is celebrating its 20 year anniversary and to mark the huge milestone, Lancome have revamped the name, the bottle and created many more shades, now totalling in 40 shades altogether... This really is a universal foundation. The liquid formula is really lightweight, which I find really easy to build up to achieve that perfect medium/full coverage we all search for without it feeling or looking heavy on the skin. Much like the cushion foundation formula, this is a really comfortable foundation to wear, which doesn't require the help of concealers and correctors to give a flawless finish. The velvety, semi matte finish is really flattering and allows the skin to look very fresh and natural. The foundation contains perlite and silica which are known for being effective oil-absorbing ingredients, perfect for anyone who suffers from oily skin or even those with normal skin who can get a little oily in the warmer weather. Dry skinned ladies, fear not... This isn't a foundation to be ignored based on these ingredients alone, we just need a little help from a hydrating primer, which is where the next product comes in. 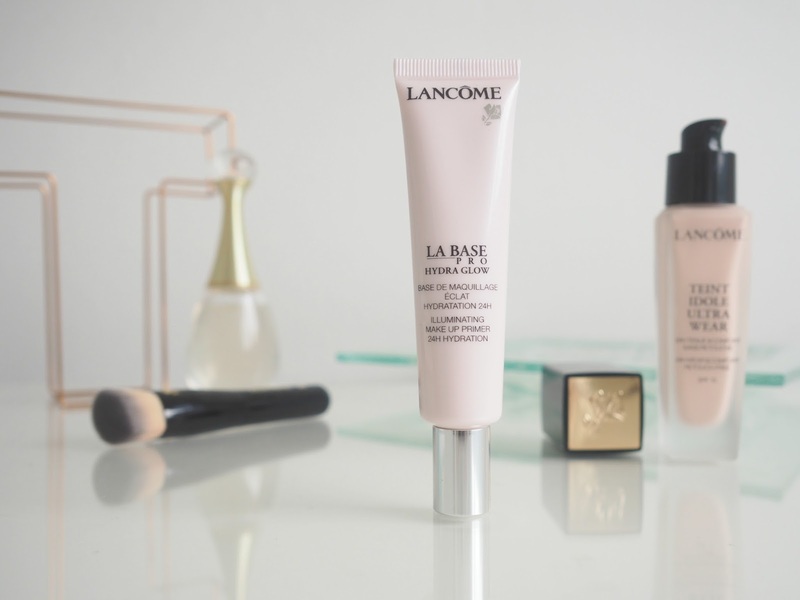 Alongside the foundation, Lancome have also released the La Base Pro Hydra Glow an illuminating makeup primer with 24 hour hydration, which works perfectly in hand with Teint Idole. Not only does this prime the skin perfectly for applying the foundation to drier skin types, but it also has skincare benefits too. It intensely hydrates, plumps and smooths the skin, leaving you looking healthy and creating the perfect base for long lasting makeup. It feels instantly refreshing on the skin and thanks to being infused with rose essence, it's wonderful for sensitive skin types like me. The colour of the primer is slightly pink toned, which leaves a pearly glow behind, which looks natural and radiant. And as two new products aren't enough, they have also brought out a new High Coverage Foundation Brush to use with Teint Idole. The tapered synthetic bristles fit easily into the contours of the face and blends the foundation seamlessly and with ease. It's a lovely size brush for popping into your makeup bag for travel or on the go touch ups too. You can be colour matched for the foundation at your local Lancome beauty counter, or even do it online here. Simply click through the pictures of the models who have similar skin tone to you and you'll have your suggested shade in a matter of seconds.